At more than 3 million visitors per year, Acadia National Park is by far the most popular of the National Park Service sites in Maine. Acadia competes each year among the “Top 10 Most Visited National Parks.” It’s world-famous for its stunning sunrises and rocky shoreline. However, as we discovered during our 2017 visit, Maine’s other historical and protected areas offer something for every #parkchaser. There are 4 total National Park Service sites in Maine. The park service recognizes one other site as an “affiliate” of the NPS but managed by the Canadian Park Service. During our October 2017 camping trip, we hiked up Cadillac and Dorr Mountains, went kayaking in Bar Harbor, and enjoyed the peak fall color season. Passport stamps are relatively easy to come by in Acadia National Park. All major visitor’s centers have stamps (Hulls Cove, Isle Au Haut, Schoodic Peninsula, Thompson Island.) Many of the popular destinations around the park (Blackwoods Campground, Jordan Pond, Sieur de Monts Nature Center, Cadillac Mountain gift shop, Thunder Hole, etc.) do as well. In the middle of the wilderness of Baxter State Park in Central Maine rests the northern terminus of the Appalachian National Scenic Trail. The terminus sits atop Mount Katahdin, the highest point in Maine (5,267 feet). At more than 2,180 miles long, the Appalachian National Scenic Trail is among the most popular trails in the world. There are no designated passport cancellation sites or visitor’s centers along the AT in Maine. However, Baxter State Park near Millinocket, Maine has good maps and information about where to visit the trail in Maine. 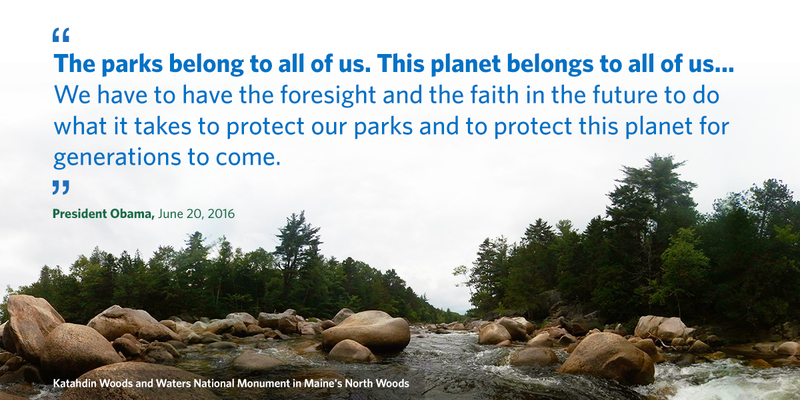 Designated on August 24, 2016, by President Obama, Katahdin Woods and Waters National Monument is one of our newest national park units. Obama designated the park one day before the 100th anniversary of the National Park Service. Katahdin Woods and Waters is very remote and still undeveloped. There are no developed campgrounds or amenities within the park. During our 2017 visit, we drove 5-6 miles of the main park loop road and had to turn as our rental car was not quite up to the task. Visitor’s wanting to #parkchase here should be ready for backcountry camping with limited developed trails. There are no established visitor’s centers for Katahdin Woods and Waters. Passport cancellation stamps are scattered around the communities outside the park. The Katahdin Chamber of Commerce in Millinocket, ME has stamps. Shin Pond General Store in Mt. Chase, ME and Patten’s Lumberman Museum in Patten, ME do as well. Hours for each of these locations vary. Call ahead to make sure the stamps are available before you drive. Although not technically one of the 400+ national parks on your #parkchasing list, Roosevelt Campobello International Park is definitely worth the visit. Roosevelt Campobello preserves the summer home where President Franklin Delano Roosevelt spent time with his family. It was here that Roosevelt learned to sail as a young man and it was here he was diagnosed with polio in 1921. The perfectly preserved home and the landscape is outstanding. The home and property include many of the family’s original belongings. The park service stages each room exactly as the family left it when they deeded it to the U.S. and Canadian Governments. The park is just over the Canadian border on Campobello Island in New Brunswick. It does require a U.S. passport for entry to the park however the grounds and tour are free. Roosevelt Campobello International Park does not take part in the National Park Passport program, however, a stamp is available at the visitor’s center desk for the Canadian program. Located not far from Roosevelt Campobello, Saint Croix Island International Historic Site is one of the most unusual National Park Service sites in Maine. The park preserves historic structures from a French settlement in the early 1600’s. The site is on an island in the Saint Croix River which forms the border between Maine and New Brunswick, Canada. Because the grounds contain artifacts of French descent, yet it borders Canadian and United States land, the site is served (and protected) by all three governments. Visitors can view the island and take a short self-guided hike to learn about the early French and Native American inhabitants. The passport cancellation station is located inside the visitor’s center at Saint Croix Island International Historic Site.